Its nice after over 50 fishing to find yet an other fishing discipline. Yes I am getting hooked on lure fishing for UK bass thanks to Henry and Cian over in Ireland. With only a few weeks left in the UK before our autumn trip back to the Florida Keys our annual hurricane break alwaysseems to go to quickly. So this morning in the cold wet dark of a Northumbrian morning I drag my self to my favorite bass mark. On arrival it was only 10 degrees but the rain had stopped but with my saying you don’t know till you go I trudged down to the beach. If it hadn’t been 30 miles from my house I would of come straight home huge north sea swell and water that looked like soup. So a few half hart ed chucks then I noticed some terns feeding about 200 yds down the beach. As we say in Florida they don’t dipped the water for fun they have to do it for a living. First chuck bangfish on what a surprise just goes to show you never know sometimes they forget to tell the fish conditions are bad. The bass here are not big but they go well on light tackle and yes they are attracted by the warm water of a power station but why not fish where the fish are. Yes I did keep this one as blog readers know I love eating fish and this one was a perfect size to keep not an egg bearing double enough said. Whilst I am spoilt with eating fish in the Florida Keys the two fish I miss are the humble mackerel and a fresh bass. So do I put on the thermals and fire up the barbie or just pop this well prepared into the the hot part of the Agra, yes I am becoming to warm blooded. One question I am often asked by anglers on our fishing holidays is what type of fishing I like and what has been my best fish ever. To be honestsince a very young boy I have just liked fishing and it has never mattered to me how big or what it was just like a rod in my hand. I have been very lucky and fished in many countries and have had some very big fish, best fish ever was caught on our island Marathon in the Florida Keys. A stunning 13lb 7oz bonefish on my own wading the local flats fishing a live prawn. The fight was epic down to the last few feet of line more than once and after more than half an hour I won. Only regret all on my own no one else there and no camera just memories that will last a life time. 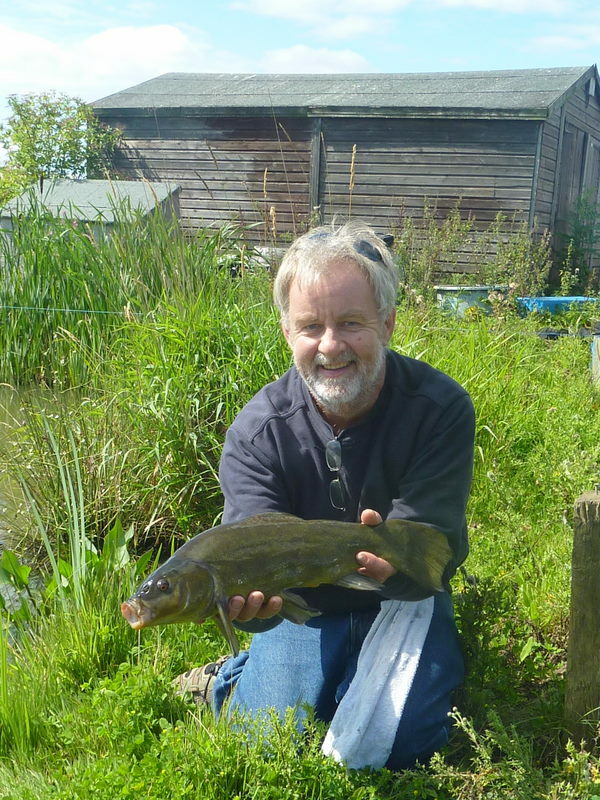 It was this year during Kevin Whincup’s latest trip we were have this type of conversation and I mention it had been a long time since I had caught a tench. To slightly digress Kevins last trip was one of the highlights this year his son Chris landing of our first 200lb+ tarpon at 209lb was amazing to say the least. It has been so nice to get accurate weights of these fish this year by using the tables of the bonefish and tarpon trust weights are to the nearest 2 pounds. It has surprised many guides just how far off their guesstimates have been. Back to the tench Kevin runs a series of coarse fisheries near York and last week I was going to be near there with a free day so on the phone and a days fishing was sett up. Check out Kevins set up at www.carpvale.com and if you go to any of the lakes I am sure you will not be disappointed Kevin runs these fisheries to a very high standard. After a substantial breakfast Kevin took me to the lakes and I chose one with a good head of big tench and it was not long after a bit of ground baiting the bubbles started to arrive. 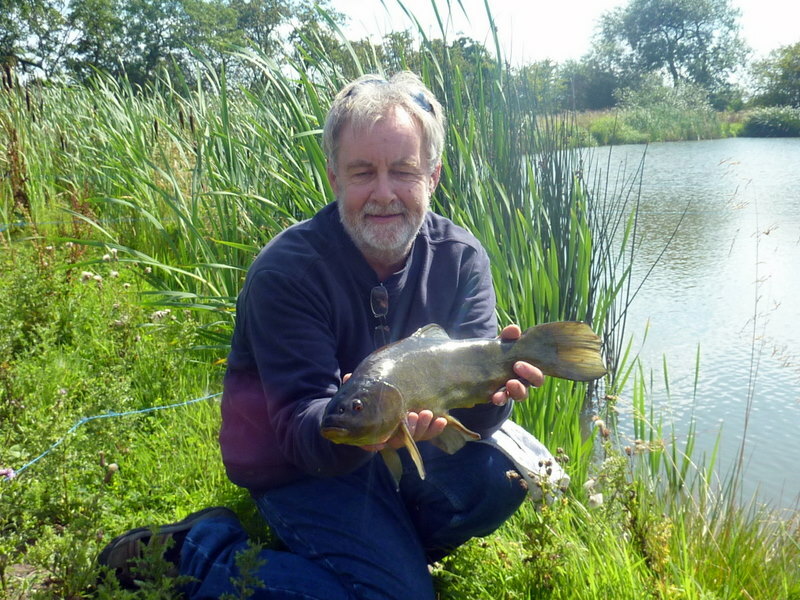 Then the slow movement of the float and distinctive take of the tench then FISH ON god these fish pull many long distant memories flooding back. Well I had a cracking day tench, carp, rudd and roach just sitting there a watching a float again a joy I have missed for a long time. A bit different from putting 5lb baits on 22/0 hooks and being slammed into the transom by a near 500lb grouper or trying to convince a 1000lb shark all you want to do is take its picture. So if you ever find yourself near York and want some first class fishing get in touch with Kevin I am sure you will also have a good day, thanks again Kev. One of the best benefits of running fishing holidays in the Florida Keys for over seven years now has been meeting new people. One of those people who has gone from a customer to a regular and now a very good friend has been John Aplin. 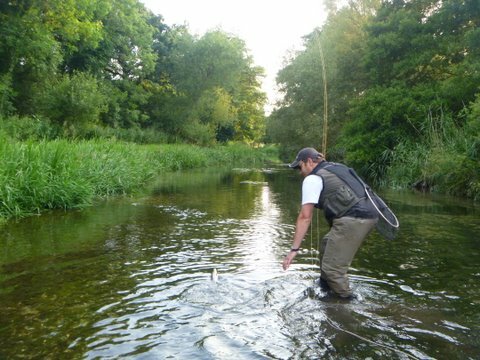 In fact for the last two years I have so much faith in John I asked him to run Fish the Dream for the month of June as it has been becoming to hot for my wife and rather than shut down John has done a fantastic job guiding. 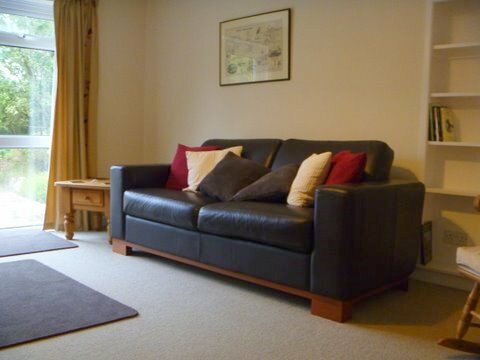 Recently John has moved and now has a self-catering cottage to give anglers to his many exclusive chalk stream fisheries the complete package. I think I can assure anyone who wants to stay and fish with John his high standards have more than impressed me. 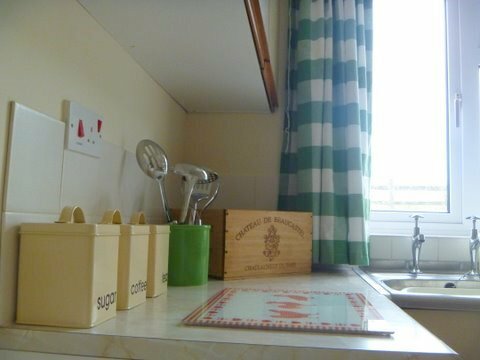 If you take a look at the photos you can see what I mean and what a place to bring the other half no problems there to get the brownie points. John does it all if you go to his website www.riverworks.co.uk you will see what a diverse range he can do. Some of the recent river projects have been truly amazing. 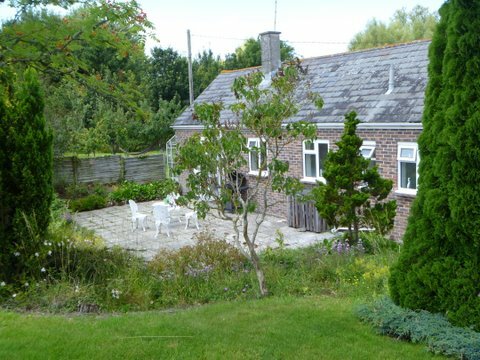 So if you find yourself in the South West and fancy some stunning chalk stream fishing with equally good accommodation or just some were to stay that just that just says relax give John a ring 01305 257490. I was deeply saddened after reading Henry Gilbey’s blog on Friday to hear about a big bass fish kill in the SW. After talking at length with Henry on the phone we were both left with a deep feeling of sadness that some people still have this primeval need to kill what they catch. I am very lucky to work and live most of the year in the Florida Keys the reason for the fabulous fishing out there is for the most part due to fish management. For many years now the Americans have had fantastic results when fish stocks needed help and the main reason for increasing numbers has been the enforcing of slot limits. It has been proven that the main help to fish stocks recovery has been putting back of lage fish. 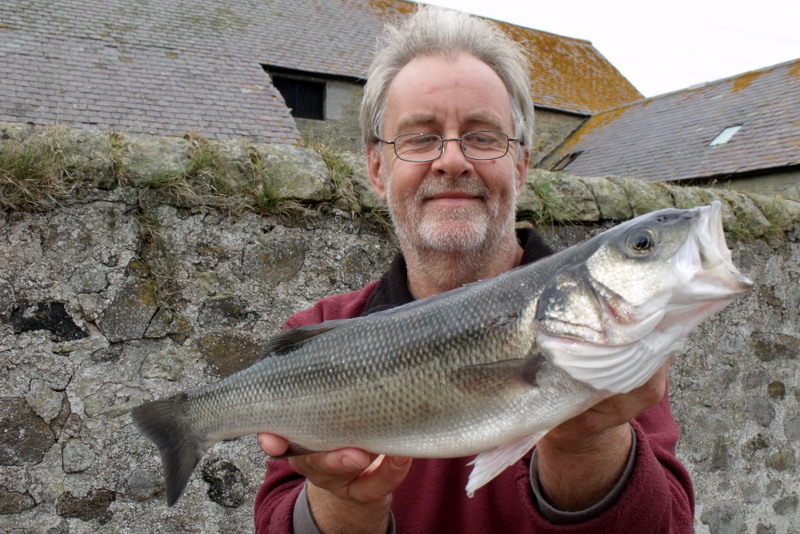 For my sins years ago I worked on a bass farm in Scotland where it was soon found out all large fish were female and in the case of the bass had taken many years to reach this size. Back to the fish kill I think think the UK is in a different situation to the US and will never have the means to enforce regulations to help bass. I personally think the only way forwards is education and it should be up to blogers, forums and publications to let people know that the killing of large old female fish will harm not help the cause of bass fishing in the the UK. As they say over the pond just do the math five double figure bass combined age over 100 years combined egg bearing capability well over a million bass does it make sense for one man to kill all these fish. Back to bass fishing I have just got into lure fishing for them with the help of Henry and the guys at Absolute Fishing in Ireland what a blast. 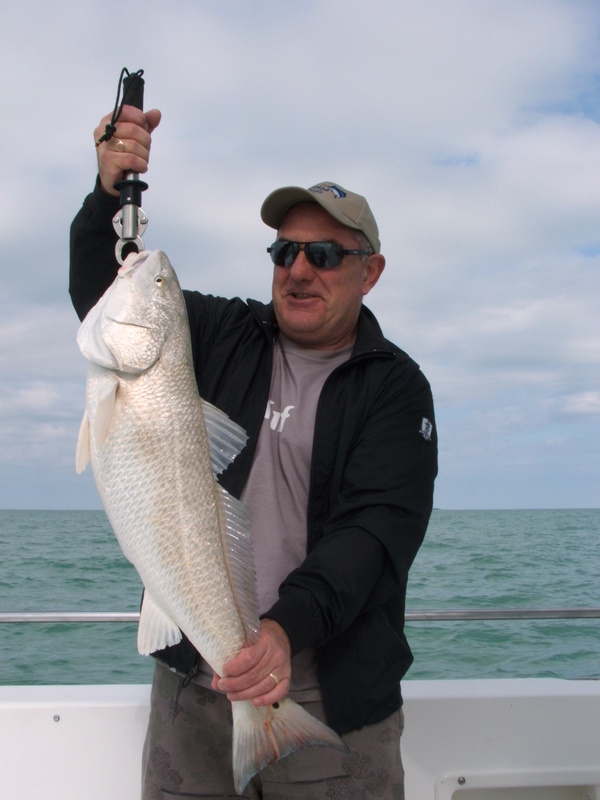 Photo with this blog a fine Florida Keys red fish ticking a box on one of our fishing holidays these fish have benefited greatly from a enforced slot limit and all fish over 27in have to put back. This does not stop sport fishermen targeting them just enjoy and put back to fight an other day but more important breed again. Sorry for this rant but please please put BACK all large bass. It is very refreshing to realize that one man can make a difference. After watching the latest program in the Hugh’ fish fight to find out that with the passion of Hugh and the support of nearly three quarters of a million people things are changing. Many years ago I was involved with the wholesale fish markets and it saddened me to hear stories of boats that caught their quota early fished on and if they caught better fish just dumped the first fish and landed the better ones. Fingers crossed this fight goes on the way it is heading and well done Hugh. One of the very pleasing things to come out of Hugh’ campaign is that of getting people to try other fish to eat and the success of the mackerel bab. As most people know I have a passion of eating fish and with a base record of 55 species caught in just 6 days plenty to chose from. We are very lucky in the Florida Keys with mackerel having king, cero and spanish to target all are very tasty raw, cooked or smoked. All are serious predators and take fly, lure and bait with such power it is hard to describe. My top is to see a large king mackerel nail a live bait fished on the kite it does not get any better. This year we had a fantastic season with the kings top crew were my boys from Jersey they had a stunning week with the mackerel. These fish and the cero and spanish will start to appear as the water cools of and I still have a couple of dates left this year so if you want to change the waterproof thermals for some fun get in touch. There is so much more to the Florida Keys than just tarpon come on over and have some fun in the sun. A change and taste of things to come ? Just back in from the Northumberland paddy fields after digging potatoes for dinner. It has been raining for 36 hours now and its still raining also this morning a stunning 10 degrees on the trip to get the Sunday paper. Whats happened to this global warming or is is now climate change. Maybe call me an old sceptic but a few years ago we had the coldest weather in the Florida Keys for 33 years and massive fish kills as temps dropped into the 30s and 40s for 10 days. But then again this year we had a very hot spring and the tarpon were nearly a month early as sea temps seem to control migration. Back here its all happening in the SW talking to Russell Weston from Snowbee [ check out their website as they are going into sea fishing bid style www.snowbee.co.uk ] a tuna was speared in the area a few weeks ago. It appears the gulf stream has move closer to the SW and with it bring the tunas. The only problem appears to be confusion of the legality for targeting tuna as it appears the UK has no quota. Hope this is sorted out soon as tuna fishing can be fantastic. Back in the Florida Keys we have an awesome tuna fishery and yes we need the weather but when they are on fire not much else comes close. 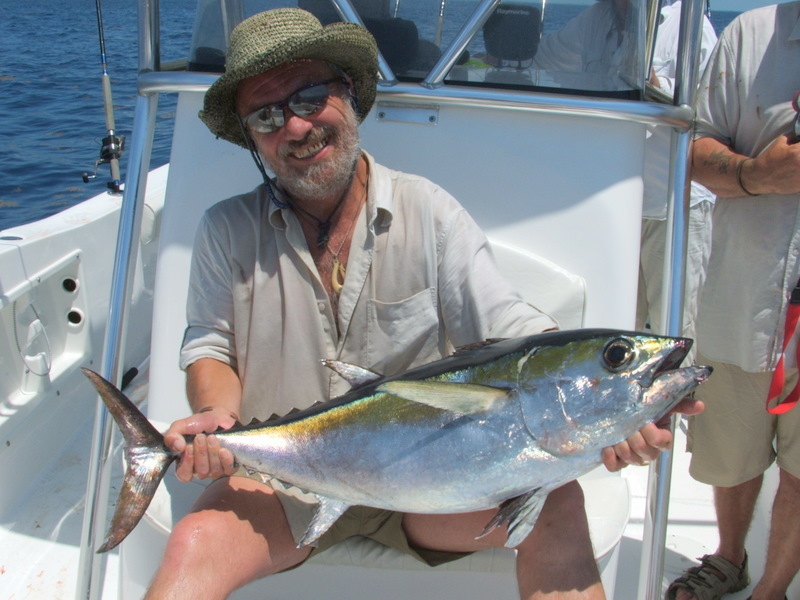 Top of our tunas are the blackfin pound for pound on the right tackle these fish will pull your arms off. Years ago it was all trolling and as is the case when trolling when its on it is fantastic but boring when its not. We had a trip on the main tuna grounds the humps some 25 miles offshore when we could not get four lines in there were so many tuna. After just a few hours we were on our way back with very tired anglers thinking about sushi and the barbie. My wife Helen just frightens tuna on a very hot barbie and until you have had seared tuna less than 2hrs old you have not had seafood. The bonus with tuna is that is ok to do a bad fillet as the meat left on the bone is top sushi. Talking about sushi had my first North Sea mackerel sushi the other day what a surprise excellent try some you will be surprised. Tuna fishing has moved on in recent years and with tuna being on a lot of peoples wish list on fishing holidays it is nice not having to troll. Butterfly jigging now probably takes more tuna than trolling and is great fun and now with the depth finding lines a lot easier to put the whole boat on fish. Comments Off on A change and taste of things to come ? After running fishing holidays in the Florida Keys for over 7 years now and fishing there for over `12 I am often asked whats be the best fish ever. 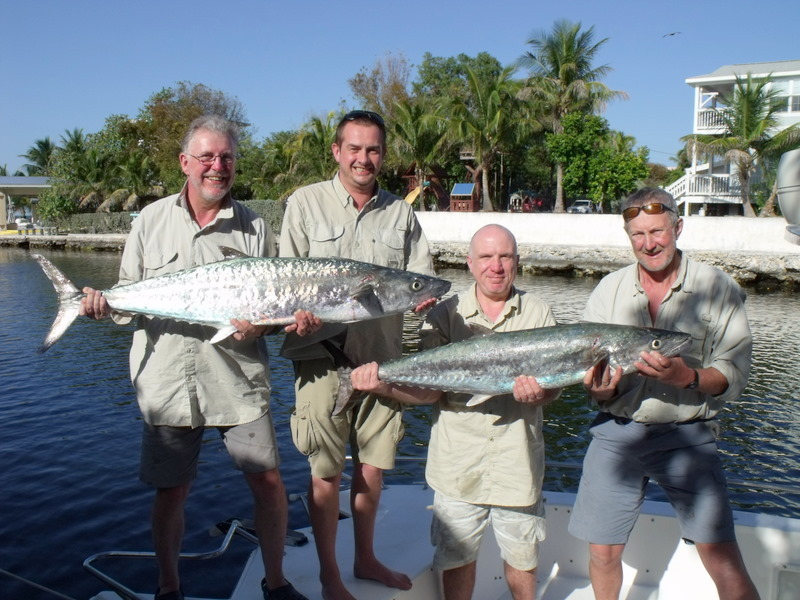 Well I am very lucky was it our first 200lb + tarpon [ it is now so much better to calculate the weight on the tarpon and bonefish trust website, than take a guess these weights are accurate to 2lb ] but at 208lb it must be up there. Or was it my 13lb 7oz bonefish again weight calculated to 2oz on measurements. 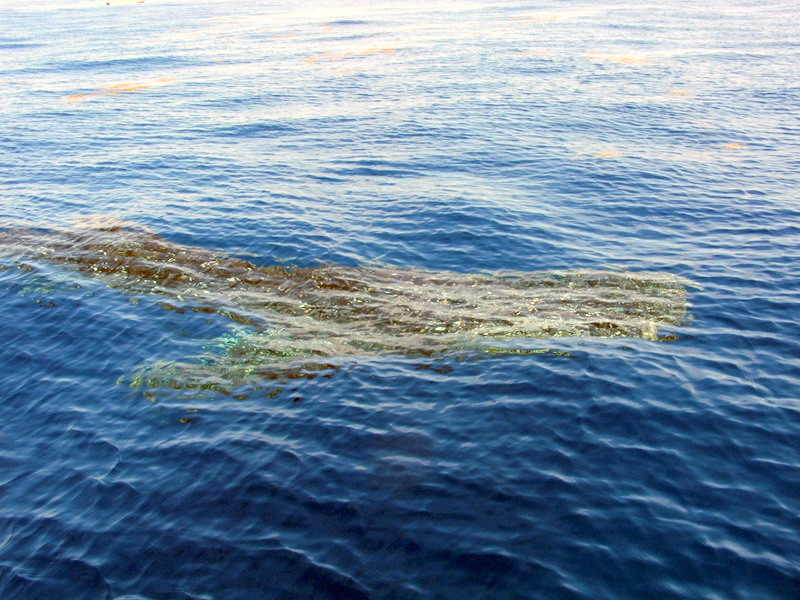 Or Lees 1000lb + hammerhead shark and an epic 2hr 23min fight. Or the two 800lb + sawfish in just 10ft of water. Or the stunning white marlin for Jerry from Jerrys of Morecambe. The list just goes on and on we at Fish the Dream have been very lucky. 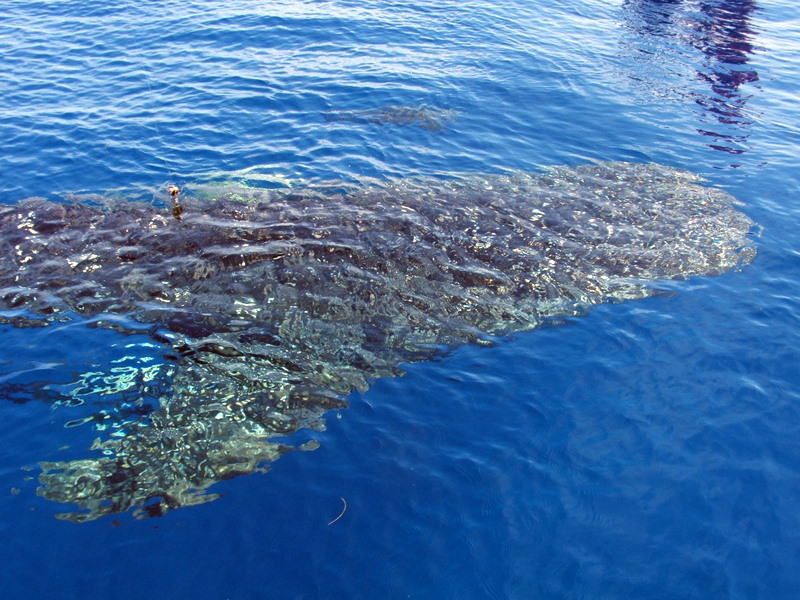 The one that tops it for me was a fish we did not even catch but were all lucky enough to just spend some time with a Whale Shark far of in the deep blue Atlantic. We were permit fishing at the time when a shout from an other boat alerted us to this monster, and what a fish she or he was just slowly swimming by feeding. To say we were all gobsmacked was an understatement it was huge its a good job they are peaceful fish the power they could generate would be staggering. This was not a big one, looking on the web the biggest went 41.5 ft and the heaviest came in at 79,000 lb, now that’s one big puppy. After swimming round the boats it just disappeared into the depths yes I am one very lucky guy.